We, at Singapore Company Incorporation, can assist you in the entire incorporation process, which generally takes only few hours if all the necessary documents and details are prepared well in advance. 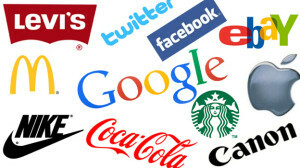 Choosing this cleverly is important for brand-building. Try to include your business activities in the name itself for this purpose. It’s also advisable to check whether your chosen company name matches an available domain name, as a suitable web address is must for increasing business these days. 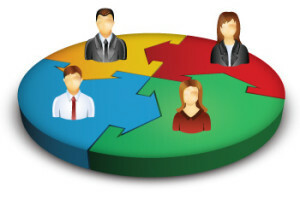 Whether to go for .sg, .com, .org or any other extensions will depend on your target market. Use the Singapore Standard Industrial Classification Code (SSIC) 2010 to select the business activities your company will be engaging in. When a Singapore Private Limited Company is formed, it must issue one or more subscriber shares to its initial members. It may increase capitalisation by issue of further shares. The issued share capital of the company is the total number of shares existing in the company multiplied by the nominal value of each share. A Singapore company can be registered with a minimum paid up capital of S$1 (or its equivalent in any currency). 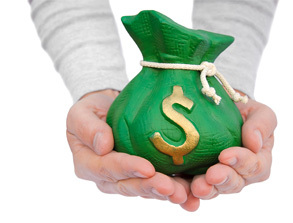 Paid-up capital is essentially the portion of share that the company has issued and received payment for in full. It’s very important to have a proper shareholders agreement in place to avoid future disputes. This agreement defines the relationship between shareholders and specifies their respective rights and obligations. It’s always advisable to protect your interests and have “controlling rights” of the company if you are the main brain behind the idea. At least one corporate or individual shareholding is required. A director and shareholder can be the same or different person. 100% local or foreign shareholding is also allowed. The Companies Act allows a maximum of 50 shareholders for a private limited company. The company must have at least one director who is “ordinarily” resident in Singapore i.e. 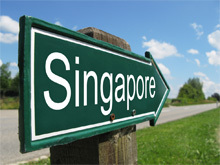 Singapore citizen, a Singapore permanent resident or a person who holds an Employment Pass/Entrepreneur Pass or a Dependant’s Pass with a residential address in Singapore. All official correspondences are send to this address. The registered address must be a physical address and cannot be a P.O. Box. Use of residential address is allowed for certain types of business. All private limited companies must appoint a Company Secretary within six months of incorporation. He or she must have the prerequisite domain knowledge and is responsible for ensuring all regulatory compliances. 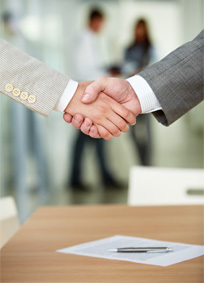 Most companies in Singapore outsource the mandatory company secretary requirement to company incorporation specialists. The memorandum specifies the activities in which the company may engage in, whereas the Articles of Association specifies the rules governing the internal management of the company. 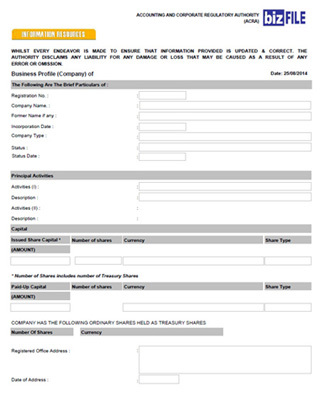 Singapore Company Registrar provides a standard MAA document that is suitable for most instances. All Singapore incorporated companies must appoint an auditor within three months of incorporation, unless the company is exempted from audit requirements. To be exempted, the number of individual shareholders in the company must be less than 20 with no corporate shareholders, and its annual turnover must be less than S$5 million. The Singapore Company Registrar issues an email confirming the incorporation of the company. It includes the company’s Unique Entity Number (UEM), which is the standard identification number issued by government to any entity registered in Singapore. You can also obtain a company business profile on payment of a small fee which contains the company name, registration number, incorporation date, business activities, paid-up capital, registered address, as well as details of the shareholders, directors and the company secretary. 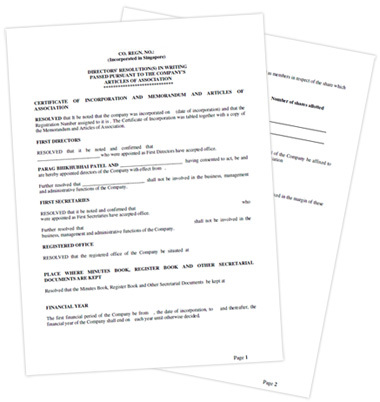 A hard copy of the certificate of incorporation can be purchased if required. 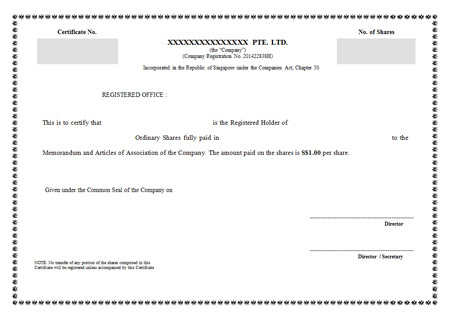 This certificate constitutes proof of share ownership and indicates shares allotted to each of the shareholders. It is the responsibility of the company secretary to issue this certificate. This resolution is needed to make appointment of shareholders and directors in the company official. A private limited company is a separate legal entity from its directors and shareholders; therefore it will need its own bank account. 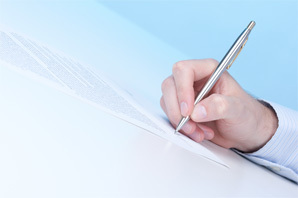 Thus, a resolution by the board of directors of the company sanctioning the opening of the account and specifying the signatories to the account is required. 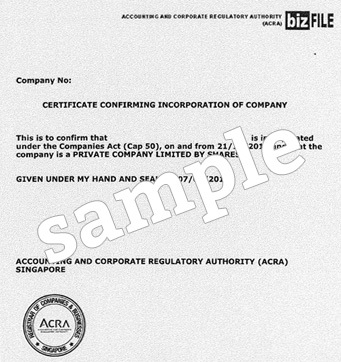 A company seal, if provided for in the company constitution, is a legal requirement for business entities in Singapore. Along with the seal, a company stamp is another important item because it affirms the credibility of a company. It makes company documents official and more authentic. That’s why, all official company documents, apart from having the Unique Entity Number (UEN) and registered address of the company, must also have an official rubber stamp. Every company must hold its AGM every calendar year, with its financial statements tabled at the AGM for shareholders’ approval. Every company must file its annual returns within one month of its AGM date. The deadline for filing corporate income tax return is November 30, every year. 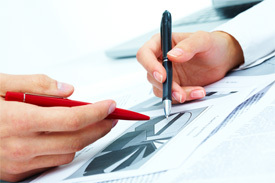 Documents to be submitted are audited or unaudited Report and tax computation. Each company in Singapore has to determine its financial year end (FYE), which does not necessarily be December 31. But it’s advisable to keep the company’s FYE within 365 days in order to enjoy the zero tax exemption for new start-up companies (full tax exemption on the first S$100,000 of normal chargeable income for its first three consecutive years of operations). Companies incorporated in Singapore can also take advantage of few government schemes to promote and grow their businesses. One example is the Innovation and Capability Voucher (ICV) scheme. Under the ICV, companies can apply for vouchers each valued at $5,000 for redemption of professional consultancy services, hardware and technical solutions. Eligibility conditions for ICV include a Singapore registered and physically present company, with at least 30 percent local shareholding, and group annual sales turnover of not more than S$100 million or group employment size of not more than 200 workers. It’s important to note that all purchases must be made only after the indicated items have been approved in the ICV application. Also, be careful while choosing your corporate bank account as Singapore has an array of banking options available to private companies. 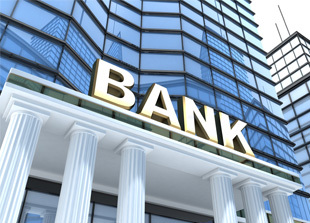 The banking requirements, application procedure and the time taken for opening are also all different. Some banks may offer an initial waiver period of bank charges, for any basic banking procedures such as depositing and withdrawing cash, or checking on the status of the account. 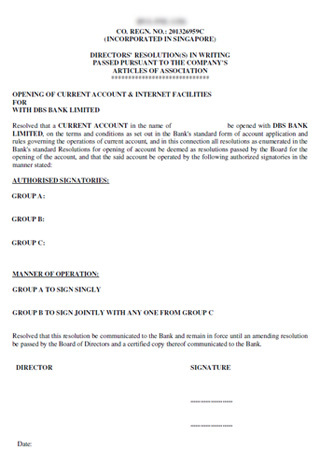 Generally, you will need the following to open the account: a resolution by company’s board of directors sanctioning the opening, copy of the certificate of incorporation, copy of the business profile, copy of company’s MAA, copies of the passports (or Singapore national identification cards), and proof of residential addresses of the directors and ultimate beneficial owners.